We offer an unlimited use Autoresponder service available for use of Members. 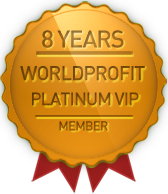 This autoresponder is included in the Platinum VIP Membership but not in the Silver Membership. Silver members who wish to access the Autoresponder have the option to either upgrade to Platinum VIPMembership to get it included at no cost, or they can purchase it singularily at a cost of $199.95/year. If you are interested in upgrading to Platinum VIP Membership to get the Autoresponder at no cost, simply submit a Support ticket asking to upgrade and we will send you details.